Ready to kick your health up a notch? It starts with what you put in your body! Why not start your day with nature's tasty fuel source; fruit! Fruit is high in nutrients such as vitamins, minerals, fiber and antioxidants and are relatively low in calories, making them a great choice for those looking to shed a few pounds, improve health markers and feel better. The dietary guidelines recommend to consume at least 2 cup servings of fruit per day. While packing fruit to bring to work may sound simple, it doesn't seem to play out that way realistically. Between forgetting it at home or squishing your banana in your bag, something's got to give. 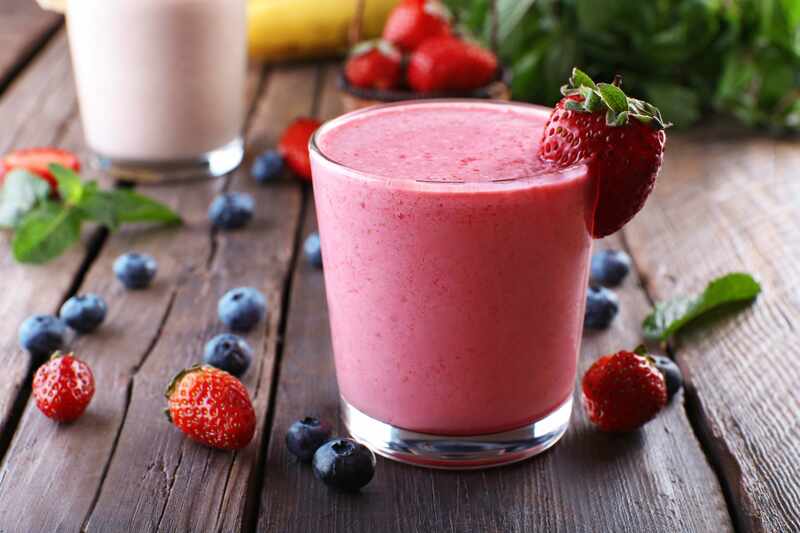 So what better way to start your morning than with a fresh and healthy fruit smoothie? This recipe will knock out your 2 servings of recommended fruit intake, and have you feeling energized to tackle anything the day brings! Combine fruit, yogurt and juice in a blender. Blend until smooth. Feel free to add ice cubes for a different texture and increase volume without adding calories. Enjoy! This can also be a great pre or post-workout drink to energize and/or replenish your muscles by adding in one scoop of your favorite protein powder. For more recipes, click here.